Thank you to ALDI for sponsoring this post. Hi guys! 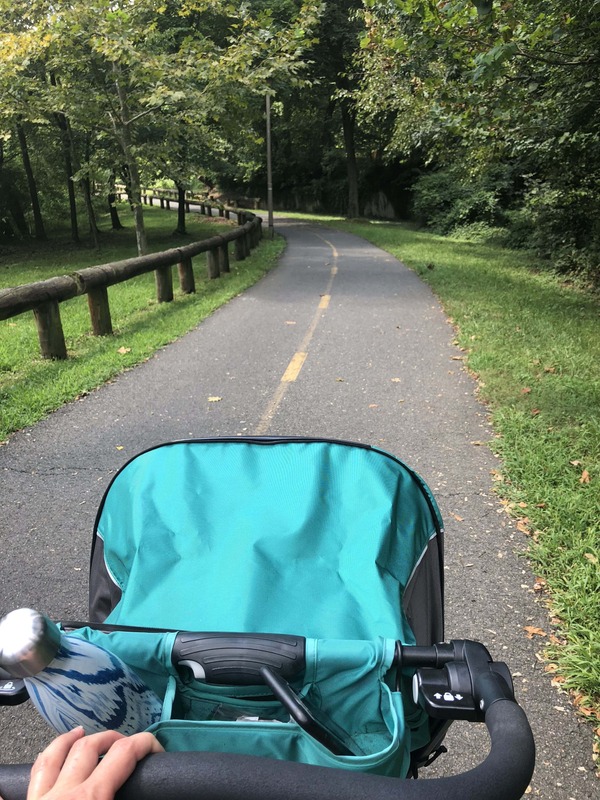 I’m back with part 2 of our long weekend adventures. It’s crazy to me that it’s already September. I know it’s still summer, but Labor Day weekend always feels like the close of summer – everyone is home from vacations, back to school, back to work! Anyway – here’s part 1 of our weekend recap in case you missed it. And now, for part 2! It was such a treat to have an extra day over the weekend – I wish all weekends were 3 day weekends, don’t you?! We kicked off our holiday Monday with a family walk. Parents – do your kids also sit in the stroller like this with their feet up?! It cracks me up that Riese lounges back like this! Having an extra weekend day to work with was especially nice because we had more time to get stuff done around the house! We spent the rest of the morning on Monday tidying up and crossing some things off our home to-do list. In addition to cleaning up, one thing we made sure to prioritize was more baby proofing! I mentioned in Riese’s 9 month update that she is officially mobile – and now that she knows how to crawl, it’s all she wants to do! She’s FAST now – it’s crazy how quickly she went from barely crawling to speeding all around. 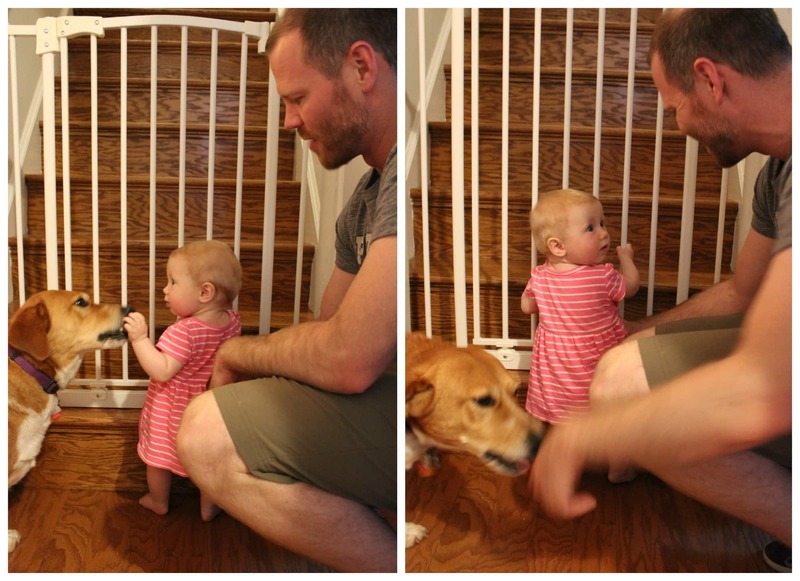 She is already starting to get into everything, so our big priority was to put up some baby gates! 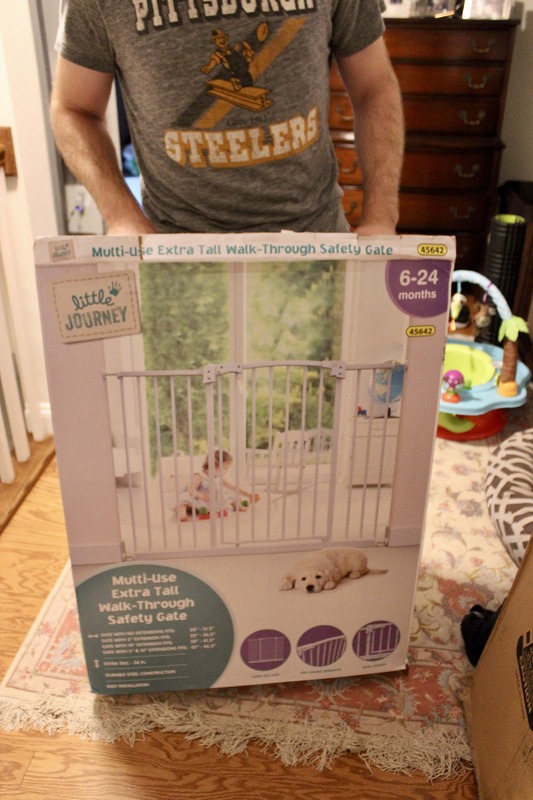 Did you guys know that you can buy baby gates at ALDI right now? I LOVE the ALDI Finds section of the store, which has food and household items that are in stores for a limited time. (Over the summer, we found some great yard lanterns and grilling tools in ALDI Finds – it’s always fun to see what’s new in that seasonal section!) Anyway – perfect timing for baby gates to be on sale at ALDI; we are now the proud owners of a couple of their Little Journey Walk Through Safety Gates. 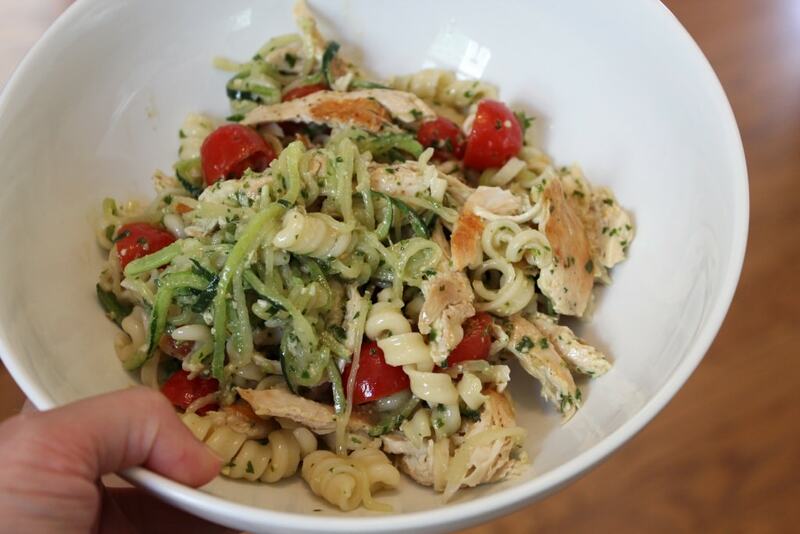 After crushing our to do list, we got Riese down for a nap and I threw together some lunch for us – a simple pesto pasta salad with shredded chicken and some zucchini noodles. To make the dish, I cooked pasta per the package instructions, and then added the spiralized zucchini (you can either buy it pre-spiraled – ALDI sells spiralized zucchini! – or do it yourself with a spiralizer) into the water with the pasta at the last minute just to soften it up. The chicken was simply cooked on the stovetop – I seared it in some olive oil with salt and pepper and then shredded it once it was fully cooked through. Combine the pasta, shredded chicken, zucchini noodles, and a few hearty spoonfuls of pesto in a bowl et voila – your easy meal is ready to rock. 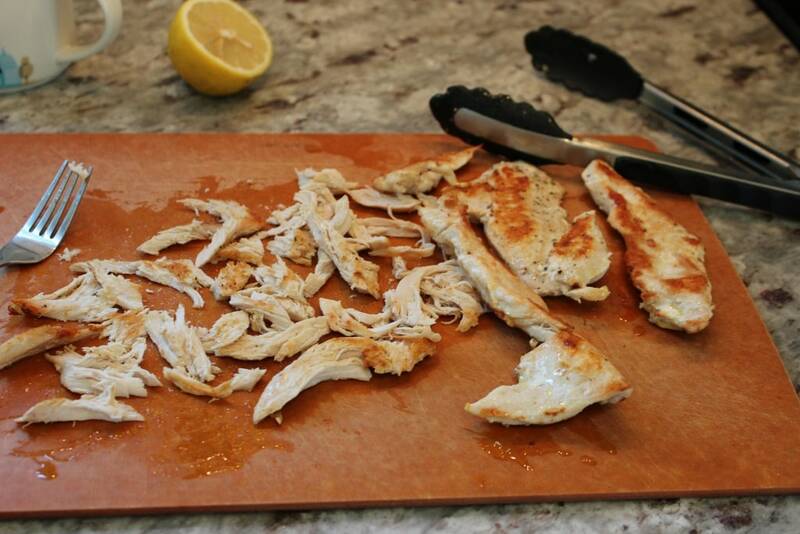 I added in the juice from a lemon and some sliced cherry tomatoes, too. 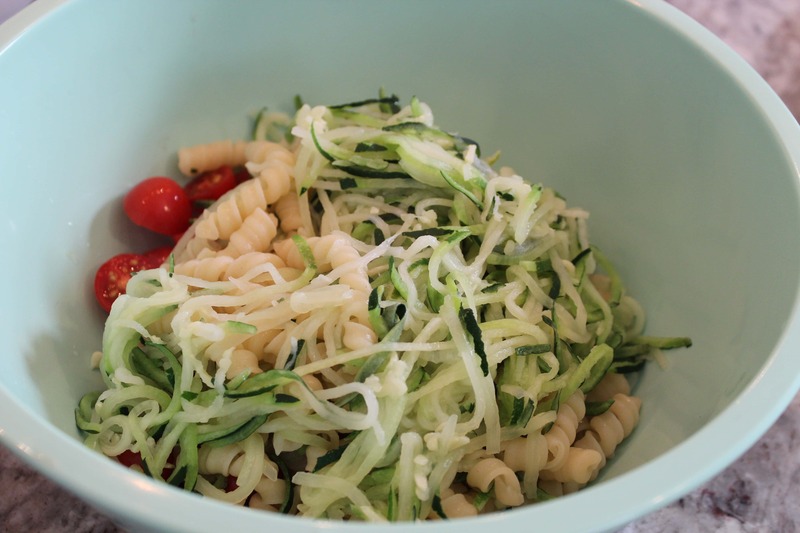 I love zucchini noodles but the key for me is to pair them with some regular pasta – I don’t find them satisfying enough on their own, but I love them like this where it’s half pasta, half zucchini! 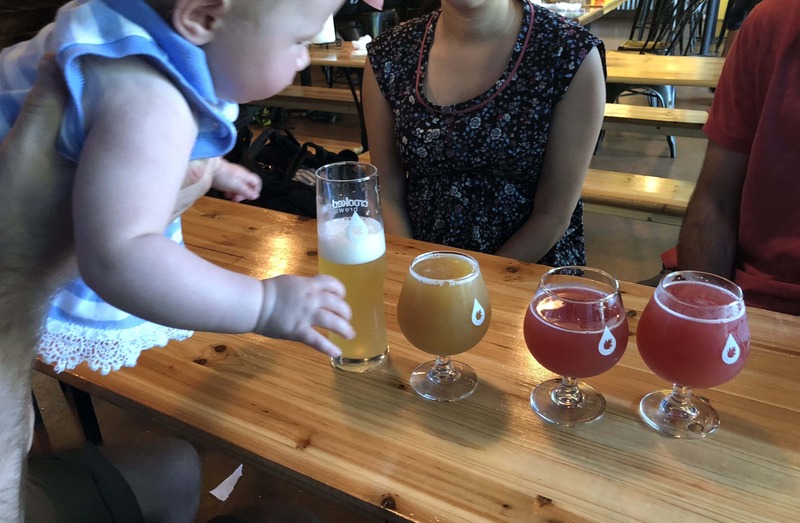 We spent some time playing with Riese in the nursery after lunch and then headed out for an adventure mid-afternoon – meeting friends at Crooked Run Brewing in Sterling, VA.
We enjoyed some beers and also shared some nachos. Nice way to spend the afternoon, and great to catch up with our friends Jackie and Aaron (and to see their 9 week old)! Meanwhile, Riese snacked on a pouch. :) We are doing finger foods with Riese at home, but having pouches on hand for when we are out and about has been key! 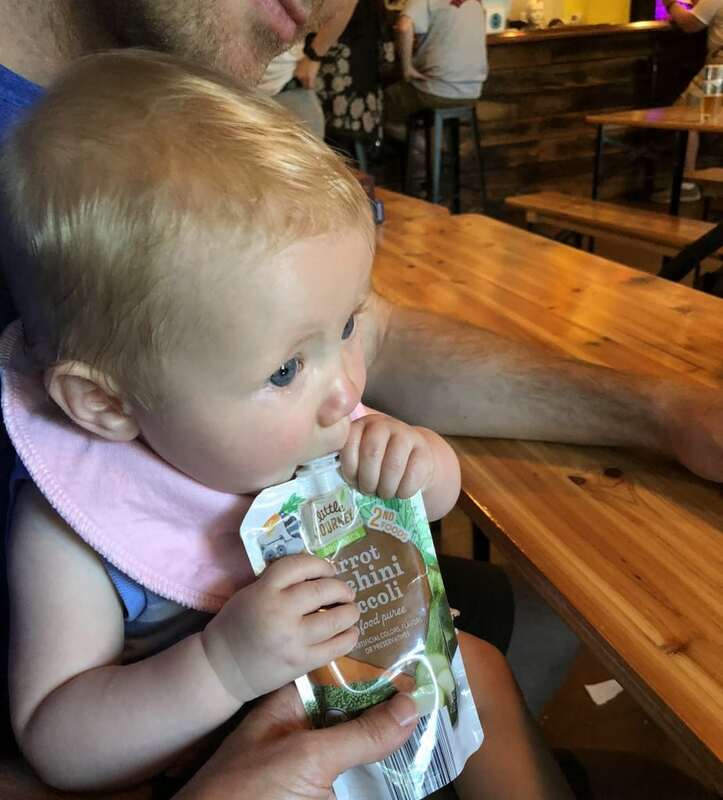 I’ve been trying to do lots of variety with the pouches I offer her – a mix of savory and more sweet, and a variety of fruits, veggies, and grains. 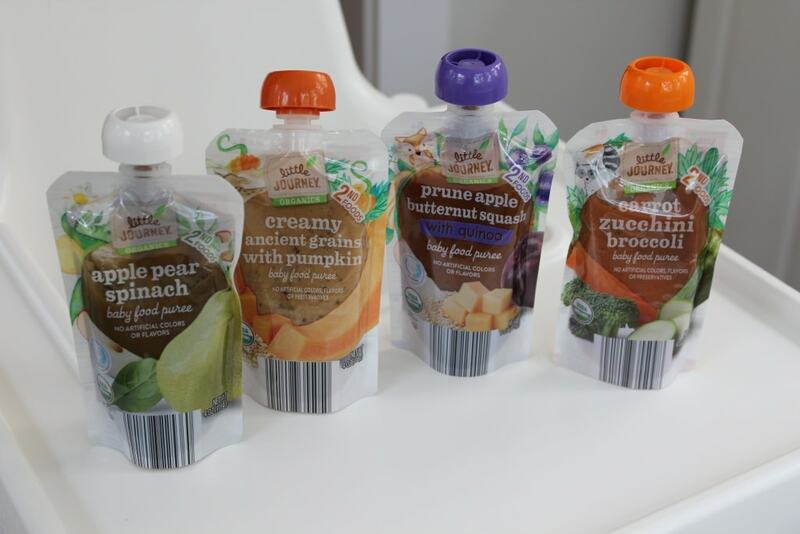 We like the organic Little Journey clear baby food pouches from ALDI – lots of options! We closed out our long weekend back at home with leftover steak salads! Arugula + strawberry + leftover grilled steak + feta + cucumber + tomato + a homemade vinaigrette (lemon juice + olive oil + dijon mustard + apple cider vinegar). 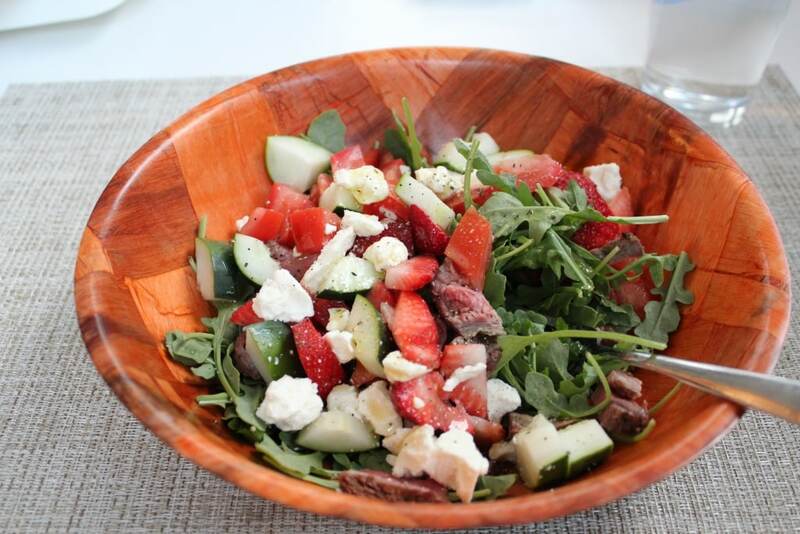 It hit the spot – reminded me of our new fave Grilled Steak and Strawberry Salads (<- recipe). I had to do a couple hours of work on Monday night after dinner, but it was clearly worth it for a full extra day of family fun! Have a great day and I’ll see you guys back here tomorrow for some Friday faves! I love Aldi! I like their individualized spicy guacamole. I like buying the thin pork chops, pifruita chips, fruit snacks, avocados, and well pretty much everything. Oh yeah, the 3 pack of the mini pizzas for family make your own pizza night and the 89 cent tortilla chips! Aldi finds is great. We got an outdoor rug for camping last year there. It really didn’t seem spicy at all! It’s called spicy though. Just a little spice. My 7 year old likes it too. And I realized my keyboard really messed up pita chips in my above post! Love their pita chips. They are perfect for dipping, they don’t break! I’m BEYOND EXCITED that the old Halalco in Falls Church across from where Ben & Tay live is turning into an ALDI! I’ve never shopped at one but always hear amazing things. 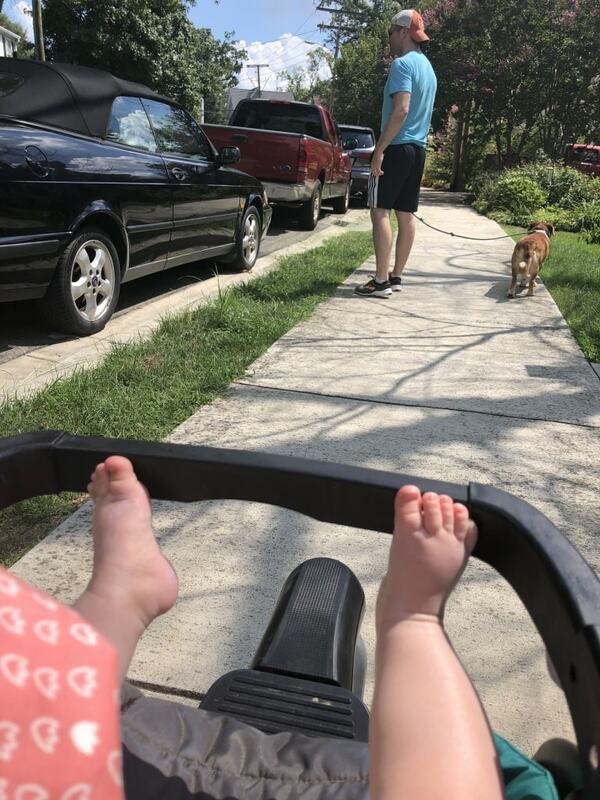 Also YES Penny totally rides in her stroller like she’s just straight chillin’, feet up, not a care in the world, it’s the most hilarious thing ever. 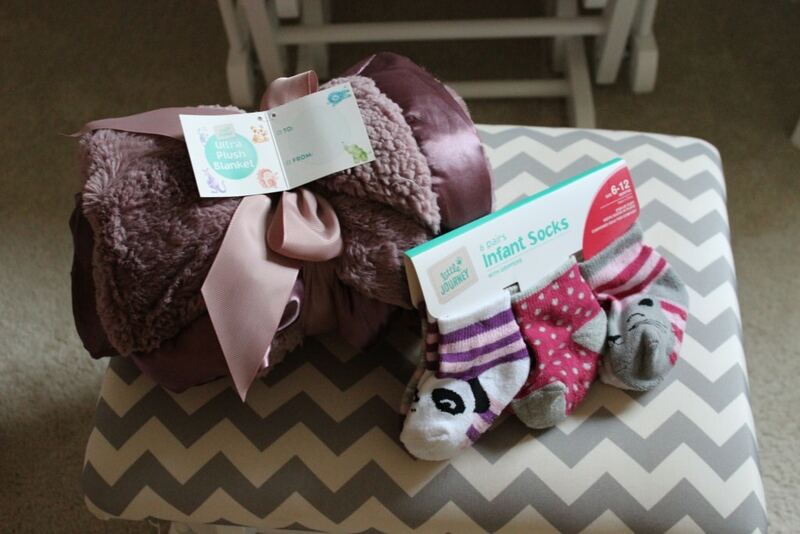 Yeah… that’s a bit of a haul from us unfortunately! I like the Fairfax Aldi best, but it’s also a bit of a drive. 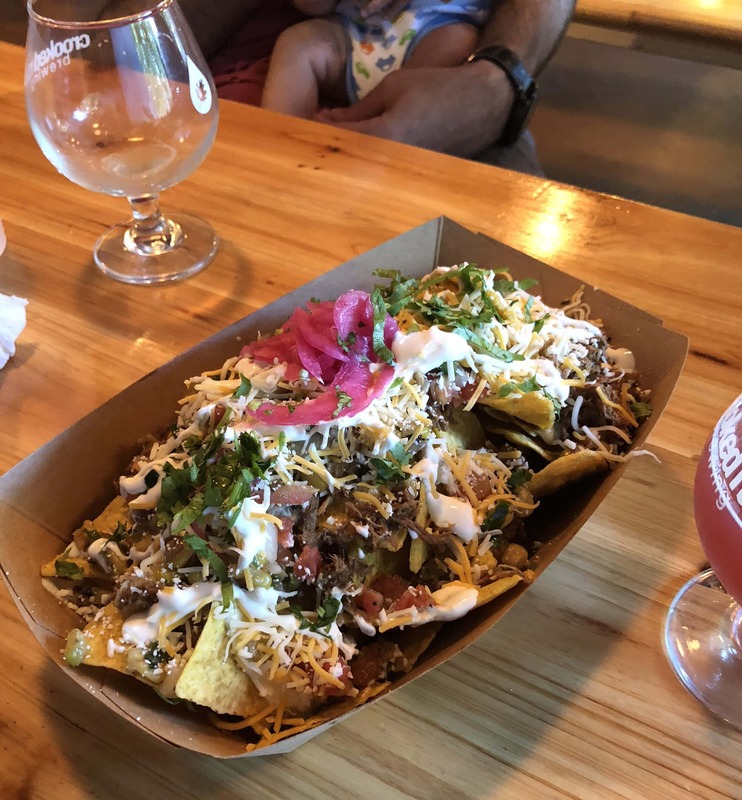 Falls Church will be easier – excited they are opening one there! I love Aldi too! Their Aldi Finds section is fun – like a bit of a scavenger hunt as you never know what they’ll have in stock! Love all of your meals, and I hope you are having a fabulous day! That’s awesome! My shopping cart is always eclectic at Aldi with the Aldi finds section in the mix, ha! 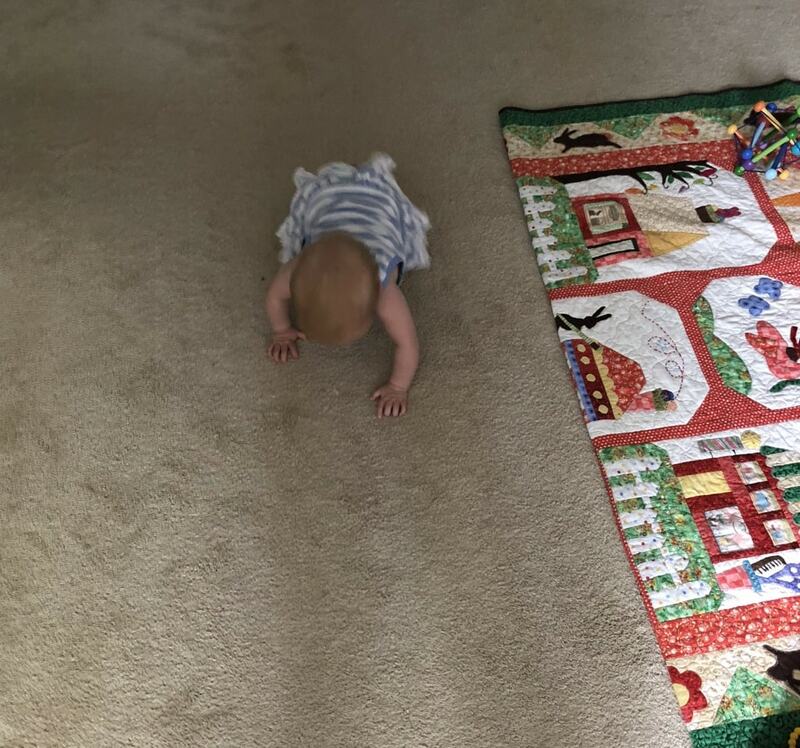 Neat to say Riese learning to crawl and then doing it rapidly, so quickly! Baby proofing now was very wise, it would appear!